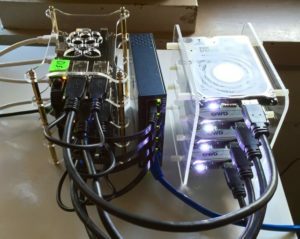 I’m a big fan of MongoDB but contrary to its “humongous” orientation, I like to think small as in ARM-based SBCs like the Raspberry Pi or ODROID-C2 and DBs under a terabyte 😉 You can get a lot of power out of tiny inexpensive computers and USB disk drives! You can find my blog entries, below, for getting 32-bit MongoDB 3.0 working on R-Pi and 64-bit, MongoDB 3.2 working under ArchLinux ARM on ODROID-C2. I had seen MongoDB community requests for a 64-bit ARM version and even a mention that there was “official experimental” development going on – including the efficient WiredTiger storage engine. I recently perused the MongoDB Community Edition documentation for version 3.4 and saw a download option for “Ubuntu 16.04 Linux 64-bit ARM 64” on the MongoDB Download Center. Ubuntu 16.04 is the default Linux supplied with the ODROID-C2 🙂 You can purchase a bare ODROID-C2 for US$40 at Hardkernel. Micro SD card or EMMC module with preinstalled Ubuntu Linux is extra. Click more for installation instructions. 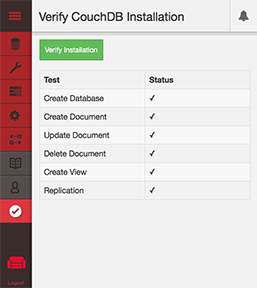 The Apache Software Foundation has released CouchDB version 2.0. CouchDB 2.0, is a “distributed” version of CouchDB, a mature NoSQL, document-oriented data-store that is accessable via a RESTful JSON API. Developers can take advantage of CouchDB’s offline capability and reliable data sync for web, mobile and IoT apps at (any) scale. Current Raspbian (November 2016) can “apt-get install” version 1.4 and I have previously written about getting CouchDB 1.6 running on the R-Pi. I have now installed version 2.0.0 on an R-Pi 3 and am sharing the process. It is pretty straightforward to get CouchDB 2.0 running on the R-Pi. It takes a combination of the R-Pi specific 1.6 install and the “generic linux” 2.0 install to get things running. 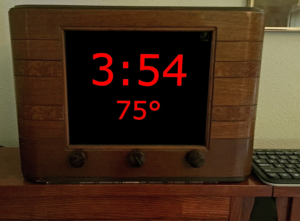 R-Pi Clock Radio – Zeroed! We had a really old alarm clock in our bedroom. Really old. The LED number segments, which were a nice dim red in color, had been dying at the rate of 1 segment a year and it was getting hard to read the time. My wife finally had enough of my “I’ll get a new one real soon” excuse and bought a new big, bright, blue LED clock to replace the old clock. It was blue … and *really* bright … even in its dim-mode 🙁 It had to go! My converted 1942 Crosley Radio was collecting dust on my workbench. I had finally received a Raspberry Pi Zero and Zero4U USB hub to play with but was already lusting after the new R-Pi Zero with camera port. I recently upgraded the audio-output on my Mac from an old USB HiFiMan Express DAC to a Schiit Modi DAC. Hmmmmm, seemed like I had the ingredients to make a BIG clock “radio” with alarm(s) and great stereo audio? I use MongoDB as my database of choice as you can tell by my blog entries. Under current Raspberry Pi OSs, MongoDB is limited by 32 bit binaries. Databases are restricted to 2GB. While waiting, I looked around and found MongoDB 3.2.6 3.2.10 in the Arch Linux ARM aarch64 package repository. I also found out that the ODROID C2 single board computer supports aarch64. This SBC costs $40 and has better specs (for my DB purposes) than the R-Pi 3. It has a 4-core ARMv8 processor running at 2GHz, 2GB of RAM and gigabit ethernet. It also supports WAY fast eMMC Flash storage in addition to Micro SD. Android and Ubuntu are the officially supported OSs but Arch Linux ARM (64 bit) can be installed as well. [UPDATE: 23 Mar 2017] If you prefer to use the default Ubuntu Linux for ODROID C2 as opposed to Arch, you can now install official MongoDB 3.4. See this blog post. 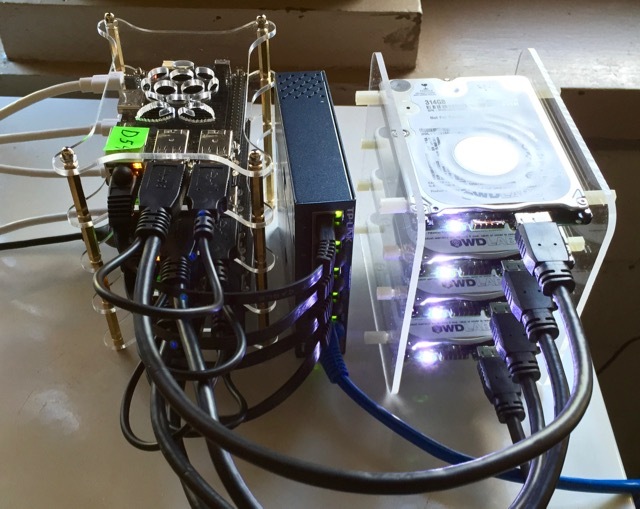 I’ve written about getting MongoDB running on the Raspberry Pi 2. View my other posts where you can get binaries (3.0.9) or learn how to compile from scratch (3.0.7). The mongo shell works great but you may want/need to code in Python, especially for device control or data logging, etc. PyMongo is a Python distribution containing tools for working with MongoDB, and is the recommended way to work with MongoDB from Python. You can either use Python 2 or Python 3. Python 3 did not come on the minimal Raspbian Jessie image but can be installed using “sudo apt-get install python3”. To install the appropriate PyMongo for MongoDB 3.0.x you can do the following from the command line. Note you could use “python3” where I use “python”, depending on your preference. I normally use the default Python 2.7. MongoDB 3.0.9 just became available but needs quite a few changes to source in order to compile on the Raspberry Pi. I worked through MongoDB build scripts for ARCH ARM Linux and managed to “translate” for Raspbian (Jessie) Linux on the R-Pi 2. Rather than creating patch files and writing instructions for building from source, I am providing my compiled binaries. PLEASE do not post links to my binaries! Feel free to download for personal use from this site. MongoDB 3.0.7 on Raspberry Pi 2! NOTE: I have made MongoDB 3.0.9 binaries available for Raspbian (Jesse) for R-Pi 2 – here.